In the entire film, there are only a few strands of dialog, most of them abruptly short. 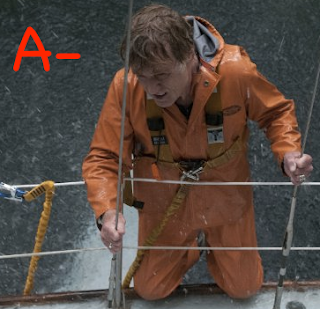 The rest is a silently slow drama with one man lost at sea (Robert Redford). It all takes place 1,700 nautical miles from the Sumatra Straights. But those questions we never get an answer to. Instead, we get: “This is the Virginia Jean with an SOS call. Over,” with the steady crash of waves and the movement of the tides out on a lonely, open sea. Will the modern equivalent of silent films come back into grove? All is Lost is a good indicator that such a thing could just about happen. It may not have obtained the level of suspense it wanted to, but a daringness to not follow the beaten path of familiar films it has in spades, not to mention a respect for plot focus not seen in similar movies of its kind (like 2000's Castaway). At the halfway marker, we start to lose a bit of patience and don’t sympathize as much with our man’s plight since the film’s artistic display of choice unintentionally detracts somewhat from the film’s goal. Redford may not have given us his full-on best, but what he gives comes close to it. A few semi-successful misleads and music pieces that don’t always help to access the more tense moments has us wondering why our captain never talks to himself or hollers out in fits of rage, but most of what we are shown was specifically intended not to overplay any one element behind the drama. Director Chandor, still mostly green in big-name film endeavors, logs a tremendous number in All is Lost, an excellent movie by all standards.